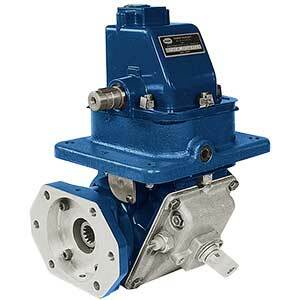 The GB Series front mount gearbox offers a variety of options for crankshaft driven power take-offs. Available in a wide range of speed ratios, shift options, and pump mountings, the GB Series gearbox is a versatile unit for front drive applications. The top half of these gearboxes consists of a modified Muncie SG Series single gear PTO and mounting plate. The bottom unit can be a TG (GB10), CS (GB60), or reversible PTO (GB30 and GB40) depending on the system requirements. This type of PTO is relatively uncommon now but was once the standard means of providing power on snow control vehicles. Maximum Torque: 220 lb. ft.